With the centenary of the sinking of the Titannic and the disasters of an Italian cruise line in 2012, the subject of ocean liners and cruise ships is a very current interest for many people. This is therefore a well-timed publication that takes an innovative look at the great ocean liners and a past that cruise lines attempt to recreate. DESCRIPTION: With the centenary of the sinking of the Titannic and the disasters of an Italian cruise line in 2012, the subject of ocean liners and cruise ships is a very current interest for many people. This is therefore a well-timed publication that takes an innovative look at the great ocean liners and a past that cruise lines attempt to recreate. When the British Empire was growing and reaching its heights, passenger ships provided the vehicles on the ocean highways that connected the ports of the world. Initially the sailing ships provided a fairly democratic accommodation because their relative small size provided inadequate space to pamper the relatively small numbers of paying passengers. The advent of steam and steel shipbuilding changed all of that. As passengerships grew larger, shipping lines competed for speed and opulence. The steerage, or third class, passengers were the bread and butter of passenger liner profits as emigrants for the Americas and the Pacific were crammed into budget accommodation that was not to be replicated in air travel until the advent of budget airlines that took the same approach of basic accommodation at a budget price with highly priced optional services that relieved the tedium of the most basic service. The gloss on profits came from the much smaller numbers of second class and first class passengers. By 1900, first class passengers travelling from British ports to the Americas paid the equivalent of £68,000 in today’s money for a passage. That great cost was justified on a level of pampering that served the most discerning tastes. The great liners had public spaces for these very important passengers that matched the finest hotels and restaurants ashore. The cabins and staterooms at least matched the finest rooms and suites in the most extravagant hotels in the capitals of the world. Where most cruise liners today are refined Butlins Afloat mobile holiday camps, the great ocean liners were designed to appeal to the luxury that was taken for granted by nobility and wealth, matching the society of their times. The author has done a great job of capturing life aboard a class of ship now gone for ever, its main purpose being replaced by airliners. 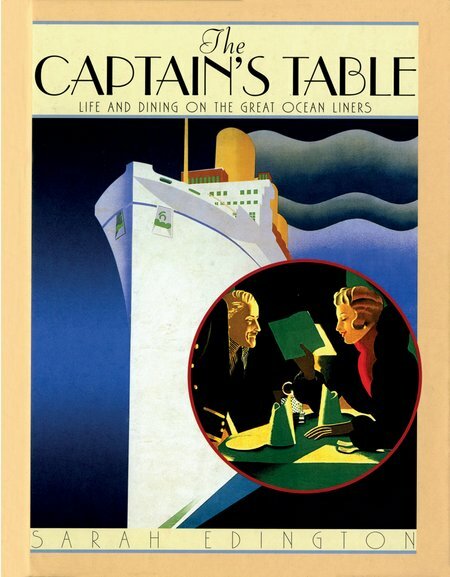 The first part of the book covers the stages of ocean liners to the vessels that carried emigrants to Australia after 1945. Almost two thirds of the book is then given to the dining, the menus and the recipes that were typical of the selection of food available. This is a book that is fun and it offers the opportunity to recreate the menus and dishes ashore.